Spent much of the day working in the shade. When it was time for lunch, I knew I wanted to be in the sun. This is not a pristine native meadow. This place had been logged and burned 20-30 years ago. The stumps still show black charring. Ponderosa pines were planted, and also seeded in from the nearby forest. When I looked for a place to sit, I noticed mullein and knapweed, non-native indicators of soil disturbance. The grand firs in the forest have been gnawed by spruce budworm. It’s not perfect. But there is a thin blanket of snow, and the cold nights have spangled its surface with glittering flakes of hoar frost. These twinkle in the midday sun. I leaned back on my pack and squinted against the glare. Basked in the warmth as I spooned black beans out of my thermos. Good to be still and quiet after a busy morning of interactions and tasks. Good to take the time to appreciate a sunny day in winter. 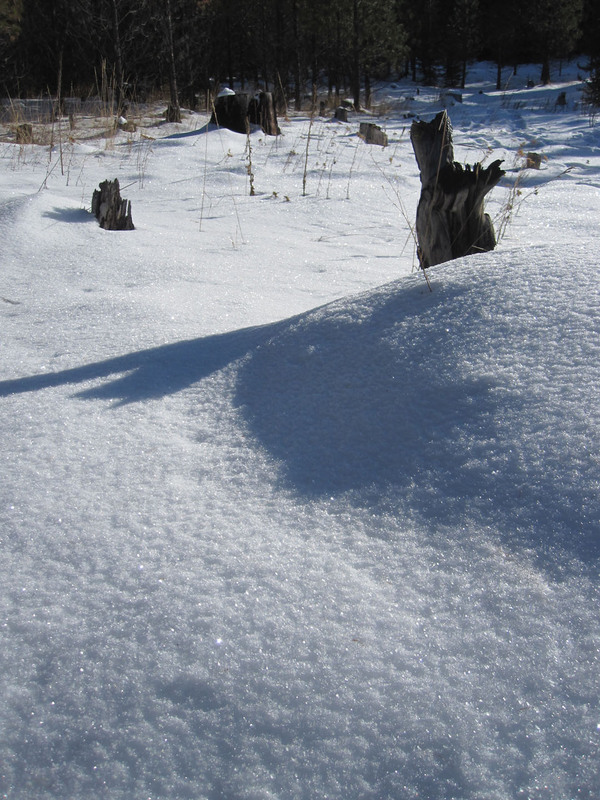 The cold cold snow is like sugar as we wade through it on our way up and down the trail. The sun’s heat faded soon enough as it slipped across the sky just above the horizon. Perfection topping imperfection… I hope it always can manage to.